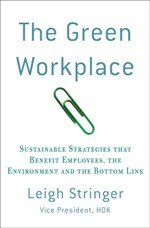 The Green Workplace: I Want a Big Belly! 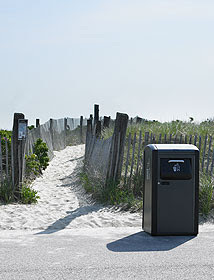 YES, they make solar compacting recycling stations too! 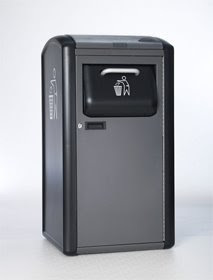 The BigBelly is a compacting trash receptacle that is completely self-powered. Instead of requiring a grid connection, BigBelly uses solar power for 100% of its energy needs. The unit takes up as much space as the "footprint" of an ordinary receptacle—but its capacity is five times greater. Increased capacity reduces collection trips and can cut fuel use and greenhouse gas emissions by 80%. BigBelly also provides cost efficiencies from labor savings, fuel cost and maintenance savings, as well as environmental benefits from reduced emissions of greenhouse gases and other pollutants. What I really like about this is that it is a very people-friendly solar device - something everyone will connect with at some point. I have worked on some DC Parks and Recreation projects that would have greatlt benefitted from something like this. And I have heard rumors that these badboys have earned a LEED point in Innovation and Design. Not bad for the little trash compactor that could!